We offer a range of finishing techniques, including corner rounding, edge painting and envelope lining. These are great ways to further customize your printed items. And if you're going to go for edge painting, why not choose a really bright, uplifting color? Like sunshine yellow! This invitation layout is so pretty and understated. It features blind embossing for the heart illustrations and cool gray for the text. The yellow just adds an extra pop of goodness to the design! 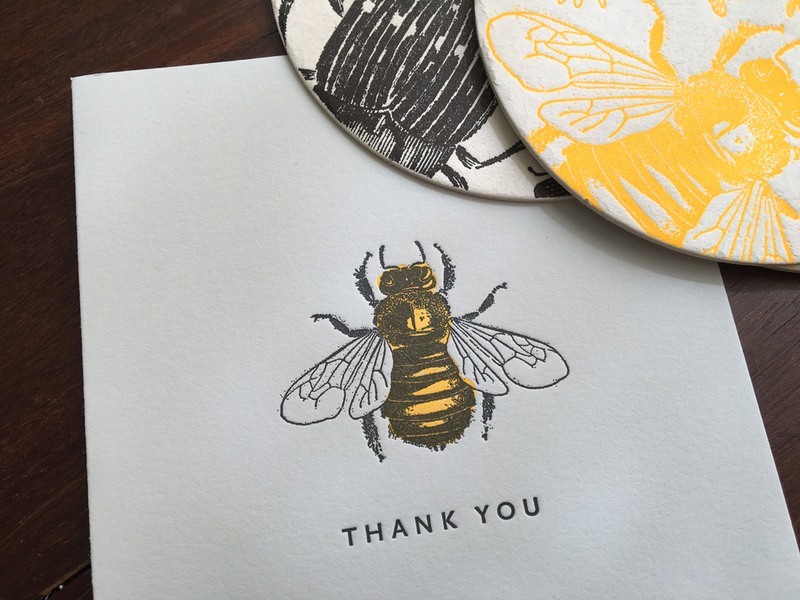 The thank you cards continue the color palette of pale tinted illustration with cool gray text. We think the french "Merci Beaucoup" is a very sweet addition too! Sunny business cards for a sunny business! We just finished printing gorgeous business cards for a mobile sunless tanning service. 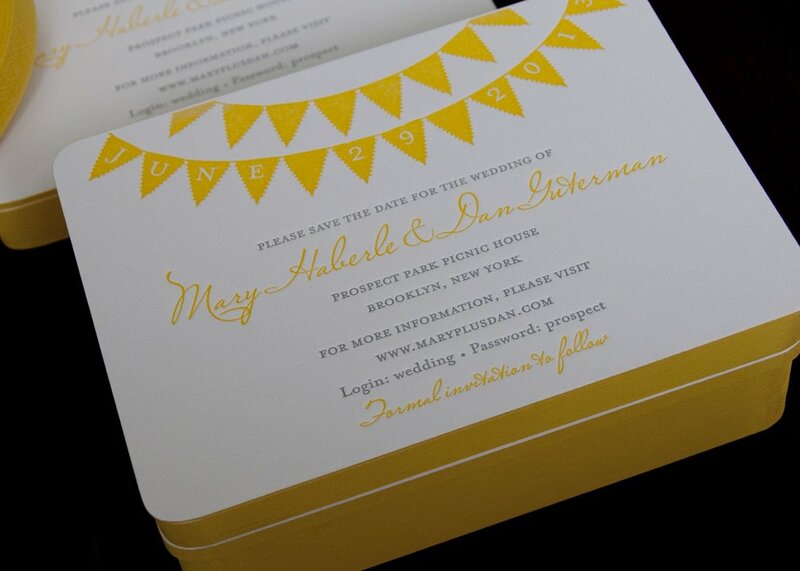 The designer created a pretty sunshine-yellow pattern for the back of the card and a simple layout for the front. This is such a charming card design: we love how the letterpress impression creates the feel of a textile in that repeating pattern. The yellow and gray inks perfectly complement each other and the pop of yellow on the edges adds another dimension to the design. When it comes to the RSVP for your wedding stationery, there are plenty of options. We are going to address these through a series of posts. First of all, the most simple option is to use a blank card which just requests that your guests respond by a certain date. This is a lovely way to encourage people to write you a personal message. We love the color choice on the invitation above and the way in which the text is a little slanted and seems to run off the card slightly. However, this style relies on the idea that your event is completely self-explanatory and all you need to know is who is coming. If you are having a few different events, or if you need to know menu choices in advance, you'll probably need a more in-depth RSVP.